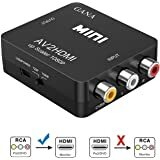 Needed to find a way to connect my old VHS unit to my new TV / Surround system because the VHS had only RCA composite (red, white, yellow) output and the receiver needed HDMI connections to work. I was hesitant about how these little boxes could convert the input to HDMI, but after reading the reviews decided to try one. It worked! To be honest the quality of VHS tapes is pretty pitiful compared to hi-def TV, but we have a lot of old movies on VHS and we can now view them. You have to supply a power supply with a 5 volt USB output on the power supply - the unit comes with a short cable USB to Mini-USB (NOT the micro-USB on most devices today). The cable is very short so make sure you can locate the converter near an outlet - shouldn’t be a big problem because the RCA composite cables and HDMI cable can be quite long. Once hooked up, you can choose 1080 or 720p output (I’m not sure what difference it makes with VHS). If you switch from one to the other there is about a five second delay before a picture appears so be patient. The instructions are very rudimentary and limited but not much is really needed. I haven’t tried it with a high quality signal like the cable TV box so I cannot comment on how well it works with a high definition input. All in all at this price point it is a bargain since it rescued dozens of old VHS movies. 5.0 out of 5 starsRetro Gaming Goodness! I needed a good workaround to make both my PlayStation (240p resolution) and PlayStation 2 (480p resolution) video-game systems work on my Samsung 4K HDTV. Newer Samsung televisions don't seem to be including standard A/V inputs (i.e. component inputs), in the form of to accept RCA component plugs. I was skeptical to get this device, but I'm pleased to say that it works perfectly. There's a selector for 720p/1080p, and video input was slightly improved. I wasn't looking for an upscaling solution for my retro gaming needs, but I saw a recognizable difference when using this device... vice using standard A/V inputs. For example: The PlayStation 2 normally outputs at 420p resolution, but using this device made a noticeable difference on-screen. Also, changing the selector from 720p to 1080p, I was able to see some slight improvement to the picture. This device is not going to improve resolution drastically or significantly, but it does seem to make things look sharper & clearer on HDTV at least (albeit slightly). 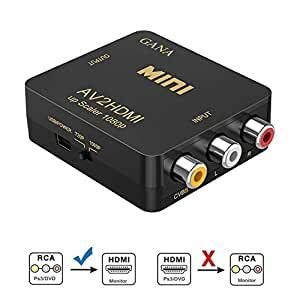 If you're looking to convert RCA to HDMI, or something to make your retro games look a little bit better... this device may fit your needs.It certainly worked for my needs, and at a decent cost to boot. I've seen devices cost three times as much as this one. This was a great purchase for my retro gaming needs, and I recommend it to anyone looking to get their older systems to work on newer TVs. You will also need a USB port available on your TV to power the device. The device comes with a USB power cable, but it is extremely short. 5.0 out of 5 starsPerfect solution for connecting old game consoles (Nintendo 64, etc.) to new 4K Tvs. 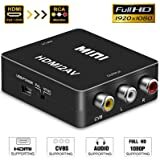 I use this converter to connect our old video consoles (Nintendo 64, Wii, PS2, etc.) to the HDMI input on a 4K TV. Insallation is simple. Connect the 3 RCA outputs from the console to the 3 RCA inputs on the converter. 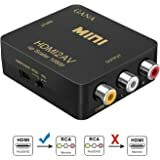 Use an HDMI cable (not included) to connect the converter to the HDMI input on the TV. Finally, use the mini USB cable (included) to power the converter. The converter does NOT include a power supply. But, my TV had 2 USB ports on the back. I plugged the USB cable into one of these ports and that worked perfectly. Alternatively, you could use an old cell-phone wall charger for power (or any power supply with a standard USB port.) There is a switch on the side of the converter that allows you to select either 720 or 1080 ouput resolutions. Please note that the converter does not “upscale” the game console resolution. Old game consoles have an aspect ratio of 4:3. On my TV the picture is stretched and expanded to fill the entire screen. This causes some distortion of the picture and (compared to 4K) makes the picture slightly “fuzzy”. But the unit works great and my kids are happy with picture. I should also note that the sound works perfectly as well. Works as advertised. 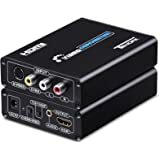 I have an older Bose home theater System that does not have an hdmi output. This is typically used for 5.1 audio along with a Sony PS3 Blu-ray player. I just got a new Samsung 82 inch TV which does not have analog video inputs which are needed to use the Bose on-screen set-up app. This is definitely cheaper than getting a new home theater. Fits the bill for me and I recommend it. 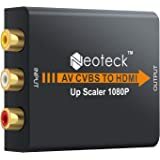 Used this to connect an older DVD player 9analog RCA Yellow, White, Red) to an HDMI input on a 32" LCD tv. Works fine though you notice some standard def. tv grains now and then but I suppose that is to be expected. Not really noticeable for normal non-picky people.